After a successful job advertisement and hiring , an employee is taken through an orientation process to know more about the company. For a company to enjoy full benefits of their employees orientation should be integrated with brand training and this is WHY. Since you wish your employees to market the company brand to the clients, be the 1st first brand seller, Sell to them how you would like them to do it. Let them know the do’s and don’ts of a performing brand. Equip them with knowledge and skills that will make them brand experts when consulted from within the company and when outside the premises. Then see them willingly transform into brand ambassadors whole heartedly. The best training is done together for greater loyalty and captivate the feel of involvement. As the C.E.O. of the company, be present to motivate the learning process and display the passion behind the brand. Informed employees will know the differentiation factor when distinguishing your brand from competitors. Therefore SWOT analysis is MANDATORY for benchmarking purposes. As always, goods and services have their selling point, and for employees to display ultimate authority and control when called for ,then consider your company value proposition as a key tool that should be known and understood by the employees in order to enhance your position in the industry. Employees should not be relegated to play behind the scenes but always be well informed to be up to the task when engaged. Every employee in the company should have marketing knowledge as much as better understand their roles and how to incorporate brand knowledge in relation to client interactions in their daily routine. Over the years companies have been engaging in employee poaching because of this factor called live employee. With a proper brand training session, your employees should be loyal to the organization even with external influence to move hitting them right, left and center. This is the ultimate power of frequent brand training sessions within your organization. Employees own the brand and seal the attachment event when tough times come calling. They will stick with you come what may, because of the brand’s unique heritage that creates a valued justified pride in the company. Therefore motivating them to work extra harder to overcome the situation together. Technology has revolutionized marketing with social media taking charge while promotional merchandise take the back seat. For your employees to advocate for your brand online and wear t-shirts, caps, stickers on their vehicles and carry that logo and tagline with pride ensure you invest time to come closer to them with the brand in hand. You will reap the benefits for them been part of your marketing arsenal. Charge and re-charge the best advocates with recognitions and offers to continually motivate them to canvas your brand where appropriate. Feature them in blogs and websites to cement brand advocacy role. You could also have your clients approve them as exceptional brand ambassadors. HERE we have offered you 10 tips towards a successful employee engagement as brand advocates, brand marketers and loyal employee that promote brand consistency and ensure a selling value proportion. 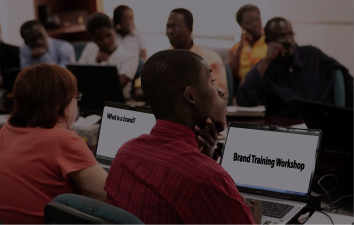 Take the brand training lessons from a brand savvy company that is well positioned to analyze and prepare best lessons for the employees.